The choice of the 8-bit generation! Video games are an electronic medium and quite naturally require some form of computer hardware to run on. The CPU (central processing unit or processor if you prefer) has always played a vital part in the creation and execution of game code. Without this important component, video games would simply not exist. After all the processor is essentially the brain of a computer system…basic stuff! And just as human brains can vary in intellectual capacity, various makes and models of microprocessors offer different performance capabilities. For game related tasks, the GPU (graphics processing unit) plays an even greater role within the modern game development paradigm. However, this article is not about development techniques and how they are to be applied to modern hardware. Rather, we will look at a specific microprocessor which played a leading role in defining gaming during it’s early stages. Two prominent periods of gaming are the 8-bit and 16-bit eras, and quite frankly of greatest import. As shiny as our games are, and powerful as our hardware is nowadays – none of this would exist without the groundwork laid down during those halcyon days. And both those eras brought forward to amazing microprocessors that truly revolutionized gaming, namely the Zilog Z80 and the Motorola 68000. 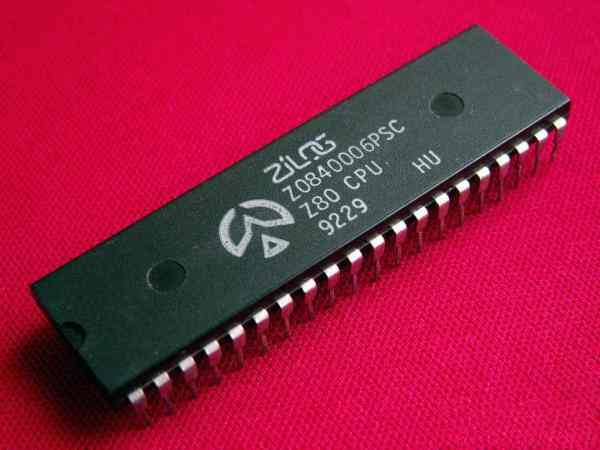 Zilog’s Z80 truly helped to kick start affordable home computing and arcade gaming from the late 70’s onward. The Z80 is an 8-bit processor, which is closely based on Intel’s earlier 8080 CPU. Due to it’s performance and versatility, it was adopted by a large variety of computer and arcade amusement vendors. Either Zilog’s original CPU, clones or variants of the Z80 architecture was incorporated into motherboards worldwide. Everyone from Sinclair Research right through to Sega made use of this mighty little chip, benefiting gaming inexplicably. Some will argue in favour of a rival 8-bit microprocessor, namely the 6502 by MOS Technology. Also very popular and widely used, particularly in the home computer market but also made in-roads in the arcades thanks to Atari. However, the true acid test of which 8-bit processor was better, rests with the greater adoption enjoyed by the Z80, especially among Japanese arcade manufacturers. From Namco’s Galaxian through to Irem’s M52 system boards, the Z80 was the CPU of choice. The above list is only a small segment of computer and console systems that the trusty Z80 found itself in. Arcade manufacturers in particular, truly took advantage of this versatile processor in numerous ways. Initially arcade boards would only be designed with a singular Z80 CPU in place. But as games were becoming more complex, some added processing grunt was required. Since the Z80 was affordable and developers already accustomed to coding games for it, a very common solution was to add a secondary Z80 to increase the board’s horsepower. SNK (Shin Nihon Kikaku Corporation) were always partial to manufacturing some fantastically exotic boards. During the mid-80’s they came up with the SNK Triple Z80 arcade board, and as the name suggests – boasts three Zilog Z80’s working in tandem. Two Z80’s were allocated to handle main CPU duties, while the third was specifically for sound CPU tasks. The games that ran on this board naturally surpassed the audio and visual fidelity of many of it’s counterparts. Resulting in games that had a look, feel and sound closer to the 16-bit standard. My personal experiences with the Z80 were both positive and enjoyable, owning a ZX Spectrum played a big part in this. I learned to program on it, firstly in BASIC and then later on in machine code – wasn’t easy but I got the nitty-gritty. Later on I got hold of Zeus Assembler which made programming in assembly far more palatable to machine code. Generally it didn’t take long to get accustomed to how the accumulator and various registers within the Z80 work together. The architecture is simple and elegant enough, not hard to figure out why it was so readily adopted. Not bad for a microprocessor that was originally intended for cash registers, instead of computers, consoles and arcade machines. We’re almost a fortnight into 2015 and I hope it’s been going great for everyone. Here at 16-BIT Shock HQ, things are moving along at a brisk pace. Work on game projects resumed early last week, after a short holiday break. Before moving on with fresh content for the new year, let’s take this opportunity for a brief recap of top posts on this blog. Several articles proved to be quite popular with readers and it would be great to showcase them again. Particularly for those who discovered this blog, only recently. The following list features a quick rundown of those posts truly, resonating with folks during 2014, and my personal viewpoint of why that is the case. Tools Of The Trade – GameMaker : Studio – Certainly the most read article on this site by a large margin, and quite understandably so. With the explosion of indie game development in recent years, everyone is looking around for the best ways to make games. This article gives a brief overview of one of the most popular game engines in existence today. Project MSG – Early Development – The game project I’ve been working on and has fortunately excited a few people. It’s a 2D retro-style shooting game with a top-down view perspective set within a cyberpunk universe. Many folks loved the logo and the pixel-art style, and in turn generated some interesting conversation between us. I appreciate all the input I’ve received and will be sharing more about this project in the near future. Developing For Vintage Hardware – It’s a no-brainer why this post struck a nerve, after all the number of retro gaming and computer aficionados keeps growing. Homebrew development is both intriguing and reinvigorating within the game development scene. Vintage consoles and computer systems, with their limited capabilities offer alternative, frankly more interesting roads for creative expression. Cybermanga – I’m a huge fan of anime & manga, particularly from the 80’s – 90’s. And it seems so are plenty of people visiting this site, even attracting significant traffic from Japan. The influence of these art forms play a big part in my own creative path and this post gives a brief overview. 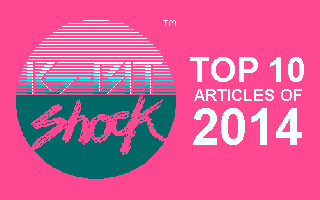 This Is For Retro Lovers – On the 2nd of June 2014, I wrote this blog’s very first post. Short, sweet and straight to the point – ultimately setting the general tone for future articles. Surprisingly it attracted a far larger audience than I was expecting, considering it was very early days for the blog. The 16-BIT Shock Design Philosophy – Probably one of the more important articles I’ve written here. The goal was to convey the direction that my game development projects were to take. Worth a read for recent visitors. Prototyping And Arcade Presentation – A fairly recent article, managing to gain far more traction than I was expecting. I covered an issue in games that I feel should gain more attention, and that’s the matter of how they are presented. Arcade games in particular are a great example of how this could be done. Anti-Establishment – Another one of those articles that had a significant impact with readers. Further reiterating key points from the 16-BIT Shock Design Philosophy article. Perhaps a tad more cheeky, but still attracting small trickles of traffic several months after it was published. Tools Of The Trade – GraphicsGale – At one point, pixel art seemed like it was a dying art form. Fortunately it has been rejuvenated recently with all the interest in retro and indie gaming. One of the better, if not the best pixel art editor is GraphicsGale. A personal favourite of mine which I go into more detail in this post. FM Synthesis & Video Games: Kick Drums & Toms – Last but not least, is this excellent article by Joe Giliver from Ocular Audio. Joe’s vast knowledge in music composition and FM synthesis is a great help in understanding what is substantially niche subject matter. Lately FM synthesis, is enjoying growing interest which is in line with the resurgence of retro gaming, computing and 80’s synthesizer music. Plenty of reading there, great way to start the new year I would think. Future articles will tread similar ground for the most part. However, there will be a shift in focus around the periods when I’ll be releasing my game projects. Naturally there will be greater emphasis on these as should be expected. Let me start this blog post by apologising for my lack of words on digital paper over the past few months. Life got in the way a touch too much with a change in jobs and numerous video game projects starting which have occupied all of my free time. It is very nice to now be in a position to share some knowledge (however limited it may be) with yourselves again. This post is going to address what I, as a drummer, consider the grounding force of any track, the kick drum. As well as discussing the kick drum and how to create them utilising FM synthesis, tom toms, the nature of which are very similar to kick drums will also be covered. 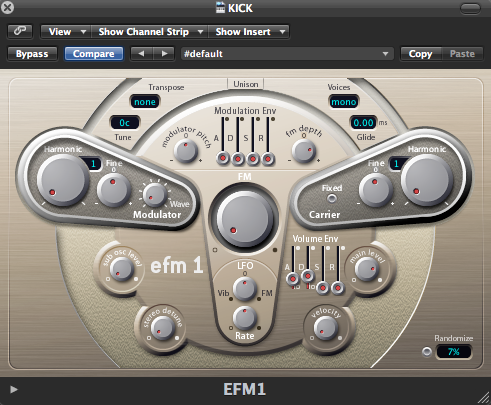 Let’s dive into this post by thinking about the typical characteristics of a kick drum. In a lot of modern music the kick drum, along with the bassline, is the root of the track. Together they provide the backbone of many productions, helping to drive compositions along and provide a strong foundation for the rest of the production to be built upon. The same can also be said for chiptunes. The majority of the time it is the bassline that provides the driving force, often reinforcing the kick drum on the beat. In some systems, such as the NES, the triangle waveform channel can be pitched down at the start of the notes to give the impression of a deeper sound, further reinforcing the kick drum. As just discussed the typical sound for a kick drum is one that provides the foundation to the track. As such they tend to be quite punchy, so it may be said to have a quick attack and quick decay with regards to their envelope. The majority of the time tom toms do have a similar envelope to kick drums. However extending the release of the envelope, which will be discussed in the next section, gives the tom a more open and sustained sound, as you would hear if you physically struck a tom tom in real life. Kicks also tend to be low in pitch, so it can be said that the frequency content consists of low frequencies, or at least frequencies in the lower range. 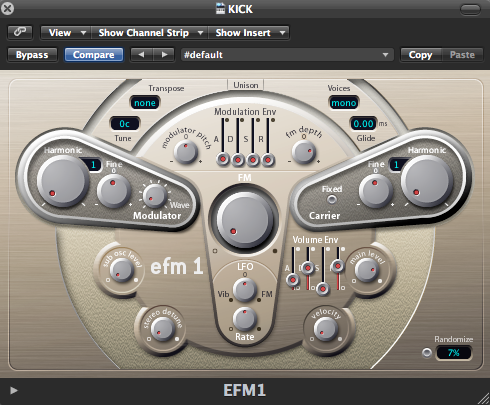 This is the main area where kick drums differ from toms, as tom toms have varying pitches depending on their size, or implied size when it comes to the digital realm. The larger the tom the lower its tone, the smaller the tom the higher its tone. Understanding these two fundamentals are the building blocks for pretty much every percussive sound you will encounter. Once you have grasped the basics of these the world is your percussive oyster. If you are new to synthesis you may be wondering what an envelope it. Let’s clarify that in this case it definitely doesn’t transport pieces of paper from one location to another. When it comes to synthesis an envelope helps shape the sound. Shaping the overall outcome of any sound in a synthesiser is done via the amplitude (volume) envelope. So in the case of a kick drum the amplitude (volume) envelope will be the tool to shape the sound so that it has the right attack and decay. As an example let’s take a look at how this can be done in an FM synth. My synth of choice at this stage is going to be Logic Studio’s EFM1. This synth is laid out in a very straight forward manner and helps with understanding the basics of FM synthesis. For the examples in this tutorial we aren’t actually going to implement any direct frequency modulation synthesis as these sounds can be created without any. However the sounds can be enhanced with frequency modulated synthesis and this will be demonstrated further down the line. Starting with a blank canvas let’s take a look at the aspects of an envelope. These are the attack, decay, sustain and release. In this example we are editing the amplitude (volume) envelope as this controls the overall shape of the sound. Notice the volume envelope on the bottom right hand corner of this synth. This is what we will be focusing on today. As a kick drum has a short sound that starts instantly you want a very fast attack, short decay, little or no sustain and a very short release. As can be seen from the image above the attack slider is very far down, pretty much at the bottom. This creates an instant start to the sound. The sound has a very slight decay which creates the punch to this sound, especially with the release being all of the way down. The sound clip below demonstrates what this sounds like. To get fatter, slightly longer sound you can extend the attack slightly, as in the image below. Extending the attack slightly removes that click at the start of the sound and instead gives it a rounded sound at the beginning. The decay can also be extending a tiny amount to let the kick sound play for long when the midi note or midi keyboard is played. An example of what it sounds like is below. Or to have a longer kick sound with less punch, much like an 808 style kick, you can extend the release to suit your taste. Extending the release will also give the tom tom sound, which will be noticed if the the sound is played higher pitched. The image below shows what the amplitude envelope will look like in these cases. Deciphering the harmonic content of a sound will allow you to select which waveform the sounds will consist of. Chiptunes typically consist of simple waveforms such as saw, square, triangle and sine waves. So when composing chiptune sounds you really want to keep to these simple waveforms. However the way FM synthesis works is by modulating one waveform with the frequency of another waveform. This creates very complex waveforms and the maths behind it can get very complex. So for the next few articles the EFM1 will my weapon of choice to explain basics of FM synthesis and how sounds can be created. For instance a future article will discuss how to create a short pitch bend at the start of drum sounds to further enhance them. As the maths can get very complicated with FM synthesis a lot of the time once you have the basics down and understand how it works it is best to refine sounds by ear. If you listen carefully to kick drums and tom toms you will hear that they are quite plain in harmonic content. That is they don’t have the raspy sound of a saw wave, or the slightly raspy but more hollow sounding square wave. In my opinion they are best constructed from sine waves, which is the simplest waveform as it contains no harmonics aside from the root frequency. The sounds you hear above don’t involve any frequency modulation to effect their pitch or tone. So later articles will show how to incorporate frequency modulation into what is currently existing here to see how the sounds can be modified.